No. 2 Minnesota State and No. 13 Bowling Green enter the WCHA Tournament Championship as the only nationally ranked programs in the conference, making for an enticing matchup in the winner-take-all game. The championship game will be held in at Minnesota State’s home arena in Mankato on Saturday, March 23, at 8 p.m. ET and the action will be streamed live, right here on FloHockey. The top-seeded Minnesota State Mavericks walked out of the opening round with a sweep of Alabama Huntsville by a combined score of 7-2. The Mavericks dished out another sweep over the weekend, this time to four-seeded and then-No. 20 Lake Superior State. The three-seeded Bowling Green Falcons also handed out a pair of sweeps on their way to the championship game. They bested back-to-back defending champ Michigan Tech before pulling off the lone upset of the tournament with a blowout and double-overtime winner versus two seed Northern Michigan. A tournament title and the Jeff Sauer WCHA Tournament Trophy will earn the winning team an automatic bid to the 2019 NCAA Tournament. The Mavericks are all but guaranteed an NCAA berth as No. 3 in the Pairwise Rankings, but are searching for their first conference title since consecutive wins in 2014 and 2015. 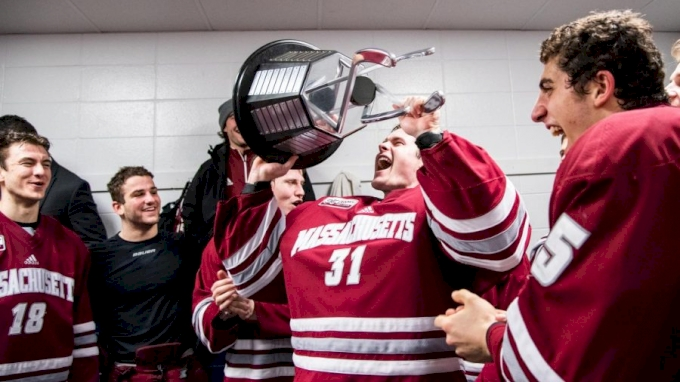 Meanwhile, the Falcons are searching for their first-ever tournament title and will play with a national bid on the line as a bubble team, sitting 13th in the Pairwise Rankings. All four of the WCHA weekly honors are matched up this weekend in a clash for the WCHA Tournament title.
.@BGFalconHockey and @MavHockey sweep the #WCHA Player of the Week awards. The then-No. 12 Falcons handed the then-No. 4 Mavericks a pair of lopsided, 4-1 losses in December, sending them into the semester break with their heads hung low. The pair of losses marked the only time the Mavericks have been swept this season and were followed by a third loss and tie. It was merely a rough patch during a 31-7-2 season, one that can be explained by the absence of head coach Mike Hastings. The winningest coach in the NCAA over the past seven years—collecting 182 wins and counting—Hastings was leading Team USA to a silver medal at the U20 World Junior Championship during the slump. But since his return, the Mavericks have gone 15-2-1, including just one loss over their past 14 contests. A scorching offense led by captain Marc Michaelis and Parker Tuomie has seen the Falcons average 3.35 goals per game (67/ 20) since the turn of the calendar. They’ve made netminder Dryden McKay’s job relatively easy, but that hasn’t stopped the phenom of a freshman from establishing himself as one of the top goalies in college hockey. McKay has gone 23-6-2 with a .932 save percentage, 1.65 goals-against average, and four shutouts. And somehow, as the season has worn on, he has only gotten better. McKay has surrendered more than one goal just one time over his past 11 starts and has only surrendered more than two once over his past 21 games. On the other side of the ice, the Falcons have been soaring with five straight wins and a single loss over their past 10 games. A 25-9-2 record heading into the championship game could be enough in the end to earn an at-large bid to the NCAA Tournament, but the Falcons won’t want to deal with the uncertainty as a bubble team. They’ll come at the Mavericks with everything they’ve got and will hope to eliminate the lack of Mike Hastings as an excuse for their sweep of the Mavericks in December. Twelve different players recorded at least a point in the sweep, including five players with a multi-point weekend. As they have done all season long, leading scorers Brandon Kruse and Max Johnson led the weekend with three points apiece. Defenseman Alec Rauhauser posted two assists as he has rounded out his offensive prowess and become a two-way threat during his junior season. Then there’s Johnson, who has near single-handedly carried the Falcons into the championship game with eight goals and six assists for 14 points over his last eight games, including a 5-5–10 stat line through his past four outings. The pair, along with goaltender Ryan Bednard, will be pivotal in the Falcons’ final push for the NCAA Tournament as they face what will likely be their toughest test of the season. Prediction: This is the type of action fans ache for; two streaking teams with offensive firepower, stalwart defensemen and a backstop among the best. No matter the outcome, fans will feel robbed given the winner-take-all, single-game format. In what could easily be a 1-0 double-overtime game or 7-6 barn-burning thriller, the Mavericks will wind up being too much to handle for the Falcons as they come out on top; if for no other reason, Dryden McKay. Don’t miss a second of the action on Saturday when you can catch it all live, right here on FloHockey.